I've been absent for a couple of days from the blog due to spending last weekend on the fells in the Lake District volunteering at Total Warrior again - you can see my post from last year if you'd like to hear more about that, it was basically more of the same except more rain, and I ended up getting put on the back of a quad bike and sent back to the Event Village on the Sunday because I'd turned blue from the cold... Anyway, I'm back now with another installment in my battle against the mountain of samples I have accumulated. Here are another six I've put to the test! Skinetica Anti-Blemish Super Toner* I've actually reviewed this product in full here, but this is a sample-sized bottle and I've finished it, so I'm including it, damn it! As I said in my review, I loved this at first; it was really effective and after the first week my skin looked super-clear. Then things went downhill a little and I ended up pretty much back where I started. Since then, things have improved a little and my skin is currently quite clear *furiously touches wood* so I think I will buy another bottle and see how I get on; prices start at £9.99 for a 70ml bottle, and go down the more bottles you purchase. Manuka Doctor ApiNourish Rejuvenating Face Mask This free 7ml sample sachet actually provided me with three full applications so I've got a really good idea for how much I like this mask - and I do like it! It feels really refreshing on the skin, soaks in well to almost completely disappear, and once the last traces are removed, leaves my face feeling soft, smooth and hydrated. I was a bit dubious about trying this as I've never been stung by a bee but both my Dad and brother are pretty allergic to them, but I didn't have any adverse reaction to the bee venom! At £49 for 50ml, this is certainly a high-end purchase, but one I would like to treat myself to somewhere down the line. Viktor & Rolf Flowerbomb Eau de Parfum I've had samples of this perfume before and absolutely adore it, it's gorgeous. This tiny sample actually lasted quite a few wears because it's a strong scent, so a couple of spritzes is all you need! The full-sized bottle is out of my budget at the moment, really, at £49.50 for the smaller 30ml, but I would like to invest at some point in the future. Badger Cuticle Care Balm This sample lasted longer than it strictly should have due to me being terrible at remembering to use cuticle balm, but when I did remember to apply it, this was lovely; thick and nourishing with a lovely gingery scent. It's quite an oily product so it's one I chose to use at bedtime rather than through the day, but it did work well to hydrate the cuticle area for me. This is something I can see myself buying again and the £4.99 price tag for a 21g tin is pretty reasonable! Merumaya Melting Cleansing Balm This little sample sachet appeared in the post a few days ago and I'm not really sure where it came from because I don't remember requesting it..!? Either way, I really like cleansing balms and this was a lovely one, which felt super luxurious on the skin, melted my make-up away beautifully and smelt gorgeous to boot. The 2ml sample was plenty for one generous application, and could easily have done two. The full-sized tube is £14.50 for 100ml which is a fairly reasonable price for such a lovely product, in my opinion, and this is definitely one I can see myself repurchasing. Merumaya Iconic Youth Serum I received this with the cleansing balm and again, it's really rather nice. I got three uses from it which was not bad going for a ml sample! The serum had quite a strong scent to it which was nevertheless quite pleasant, and felt rich on the skin. I did find it left my skin feeling a little tacky as it's quite a heavy texture for a serum, but then my skin is very oily, so for drier or more mature skintypes this might be a plus! The full size is £34.50 for 30ml which isn't badly priced as serums go and this is one I may consider in the future. Do you keep hold of samples? Have you tried any of these products? What's the best product you've ever had a sample of? PS, Don't forget to enter my 500 Bloglovin' Follower Giveaway - there might even be some samples in the prize!! great idea to do mini reviews, I love Skinetica. These sound really good. I love Viktor and Rolf. I have far too many samples I need to use up! I'm planning on taking a lot of them on Honeymoon with me. 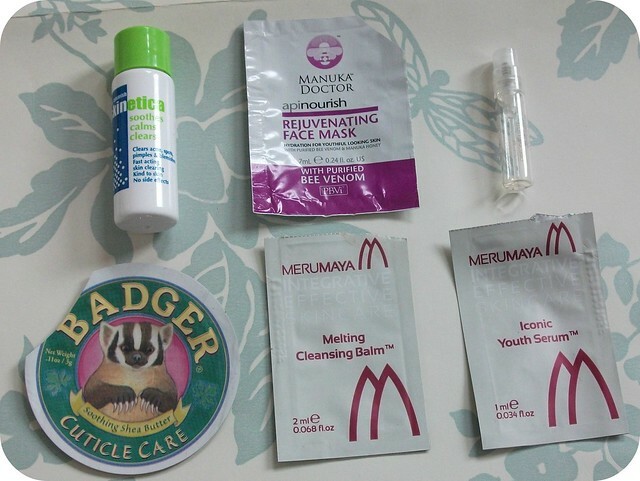 I love the badger stuff, the packaging is just so darn cute! i used the skinetica for a while but didn't really see any difference :( booh!